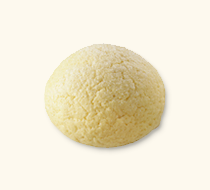 The rice flour which we use for the dough is especially made from rice cultivated by farmers under JA Kyoto. Our facility only mills the amount of rice flour necessary at any given time so you can always enjoy the best taste possible. 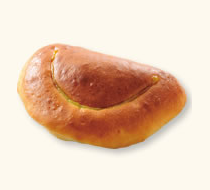 Try a taste of our moist and springy rice flour bread that is only made possible through what is provided by nature! 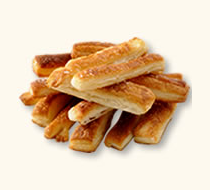 *Freshly ground rice flour produced under JA Kyoto is used for all our bread. Here you can see some of the products we offer. *Products that we sell change depending on the season. 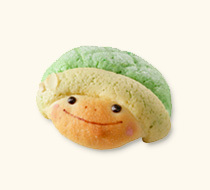 Rice flour bread designed to look like Kameoka city’s mascot, Kamemaru-kun. Since each one is designed by hand, they come a variety of expressions. 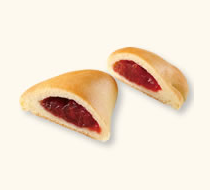 Available in sweet red bean paste filling or cream filling. Bread with a fluffy and springy texture made using rice flour. Toasting it gives it an even fluffier texture! 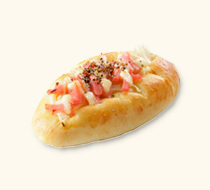 A moist and chewy bread loaded with potato, tuna and mayonnaise, making a good combination. 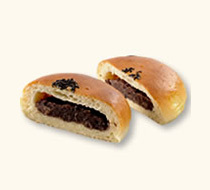 Specially selected sweet red bean paste and the moist texture of rice flour bread interwoven together in perfect harmony. Homemade biscuit dough placed on a moist and chewy rice flour bread and baked. A cornet made using a springy dough made from rice flour. 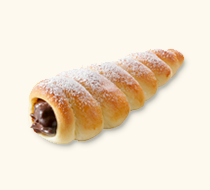 Loaded with chocolate cream. 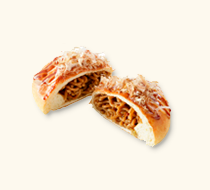 Rice flour bread packed with sauce-flavored yakisoba. A long-standing popular item to this day. 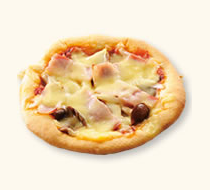 A pizza with a tomato base and Hatakeshimeji mushrooms produced in Kyotanba Can be enjoyed as is or warmed up! 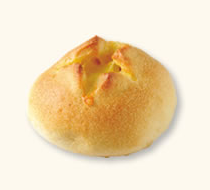 Bread with the savory flavor of cheese that will leave you wanting more. Why not try it with some wine? 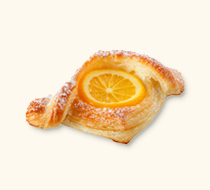 Danish dough topped with custard cream and an orange slice. A refreshing sweet yet sour flavor. 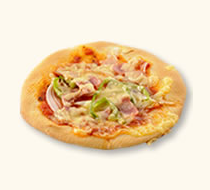 Ham and onion embedded in rice flour dough with a moist and springy texture, topped with mayonnaise and black pepper. Danish dough sprinkled with granulated sugar and baked. You’ll be tempted to pick it up with your fingers. 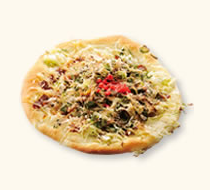 Pizza made using rice flour dough topped with plenty of vegetables. Baked curry bread that hasn’t been fried, making it a very healthy option. 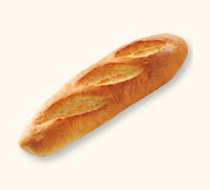 Baked French bread with a moist and springy texture topped with seasoned cod roe which gives it its mild salty flavor. The delicious smell of bacon will make your mouth water. 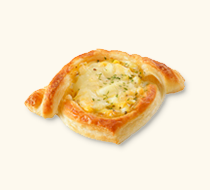 Baked to a perfect hardness, making it easy to enjoy. 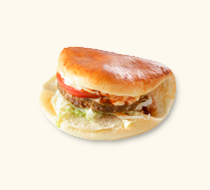 You can of course enjoy this toasted, with ham and vegetables or even with rusk. Made using locally produced Kujo green onions, and it looks like and even tastes like okonomiyaki. A standard jam bread filled with strawberry jam that gives it a refreshing tart flavor. 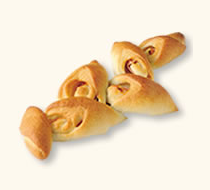 A springy dough generously filled with a creamy custard filling, loved by kids everywhere. A perfect fluffy texture created from just the right amount of sweetness and rice flour. 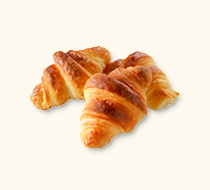 Possesses a unique taste different from other croissants. Uses a juicy Kameoka beef patty. 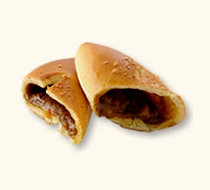 A luxurious product sandwiched in a moist rice flour bun. 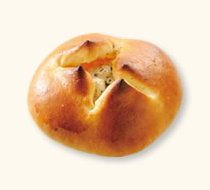 A danish with a fluffy and flaky texture and locally produced eggs. Perfect for breakfast and lunch! Filled with a cream that possesses a mild macha flavor. 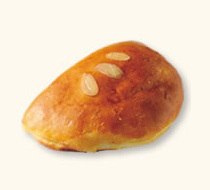 This cream bread allows you to enjoy the taste of Japan. 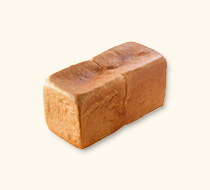 Given that rice flour bread tends to get a little hard the following day, please heat the bread using a microwave. 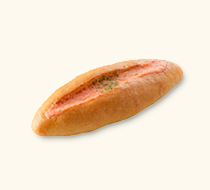 This way you can enjoy it as if it was fresh from the oven. 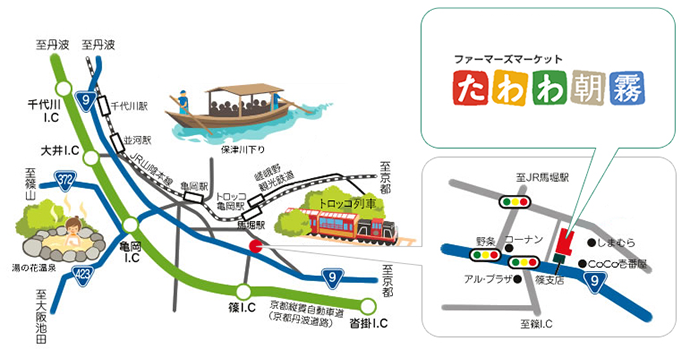 Keihan Kyoto Kotsu Bus 10 mins. Copyright(C) 2005-2017 JA KYOTO All Right Reserved.